Venkatesh Naik is a 45 year old man who used to work at a factory in Davangere called Green Agropak Pvt Ltd. Belonging to a middle class family and being the sole bread earner, he had been working extremely hard to take care of his family. However, things turned out to be extremely difficult when he developed a medical condition called as SMA thrombosis. SMA thrombosis is a rare condition where blood does not flow to the intestine. Venkatesh had abdominal pain and this condition had badly affected his small intestine. It became gangrenous and he had to undergo an emergency life saving operation to get his entire small intestine removed. In order to survive, he needs Total Parenteral Nutrition for the next two months and then he has to undergo a Diseased Donor - Small Bowel Transplant. This means that his small intestine will have to be replaced. This will then be followed by post operative treatment. 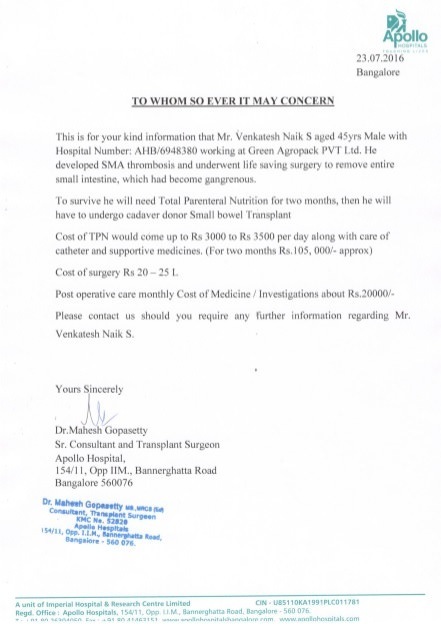 The total cost for this operation and treatment to replace his small intestine is about Rs. 30 Lakh. As a part of the maintenance department of his factory, Venkatesh managed to earn only about Rs. 17000/- per month. With this salary he used to support his two student children and elderly parents. This also means that he is not in a position to afford the transplant. He needs your help in order to get better and continue supporting his family. Please contribute to help Venkatesh survive. Your support will give hope to him and his family. Here is an update on Venkatesh. Venkatesh has been discharged from the hospital and is recovering. He was hospitalized a few days ago due to dehydration and reduction in the creatine amount. He was shifted to ICU for further care. His kidney functioning has improved and is currently at home. Thank you for all your support and love. Please pray for his recovery. Thank you for raising funds for Mr Venkatesh Naik. Without help from you all, he would not be alive today. He is now recovering from life-saving small bowel transplant. He went through a rough time for the last 8 months. He lost his small intestine from clot in the main blood vessel supplying intestine(SMA thrombosis). His family was motivated to get him better, hence he was referred to Apollo Hospital for small bowel transplant. While waiting for a suitable organ to become available, he was dependent on total parenteral nutrition, (all his nutritional requirements were met with special preparation given by veins). This alone cost him about Rs 4000/- per day. He developed complications of long-term TPN, a fungal infection, which needed prolonged antifungal injections( 6 weeks) and he had to be hospitalised during this period. He also clotted off his main blood vessels in his neck and hand, which needed thrombolysis and multiple interventions to open the vessels. He was admitted about 5 months at a stretch in specialised ward to treat him. He was a sole bread earner of his family, he worked at a small factory near Davanagere. Determined to get him better, his family, wife and two children sold their property at hometown and shifted their base to Bangalore. They money raised by this means was not enough to meet his medical expenses. His son worked odd jobs to meet the day to day running expenses. His daughter raised funds with help of her friends and teachers at school to purchase TPN. Meanwhile, Apollo Hospital and the treating doctors understood his financial situation and helped in reducing the cost of his ongoing treatment. 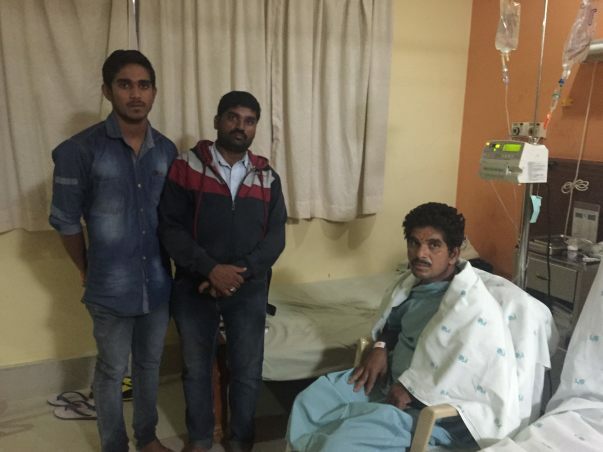 Doctors did not take any professional fees, hospital gave him accommodation at highly subsidised cost. Now that he has undergone life-saving transplant, we want to see him get better and go back to his work. He still needs a lot of help. After discharge from hospital, he will have to stay in hygienic place for a couple of months. He will need frequent blood tests and immunosuppression medications life long and certain preventive medications( to prevent infections) for few months. Please help us raise more funds so that he has successful outcome and goes back to become a valuable member of the society. Venkatesh is looking forward for the transplant as the infection persists. Last week he was about to have a donor but the organ was not in a good condition, so the doctors decided to pass it. Every time Venkatesh gets discharged, he comes back with an infection. Hence a transplant at the earliest is what the doctors have strongly recommended. However, on the lighter side Venkatesh's son Vinay is back to college. The hospital has given reference documents to the college so that he can continue with his studies. 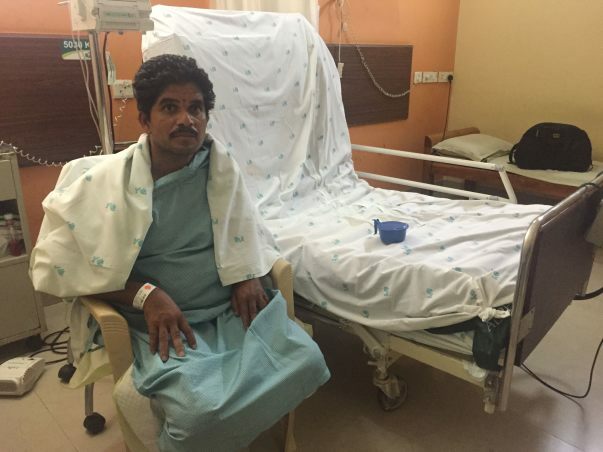 Venkatesh’s wife is looking after him and he is under parenteral nutrition via blood vessels. Thank each and every supporter for their support and let’s pray together for Venkatesh!